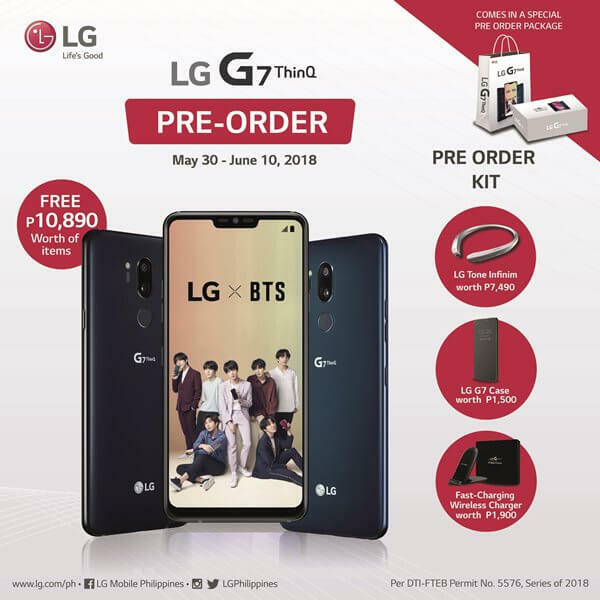 Home LG News Smartphones LG Announces G7 ThinQ Pre-order Details in PH! LG Announces G7 ThinQ Pre-order Details in PH! It’s official! LG Electronics recently announced that its latest flagship smartphone – the LG G7 ThinQ – is now up for pre-order. Moreover, the company revealed the mechanics for its pre-order program. To pre-order the LG G7 ThinQ, customer must pay a downpayment worth Php2,000 within the promo period in any participating stores. It can be paid in cash or straight payment through credit card. As part of the promo, customer will get the following freebies: LG Tone Infinim Bluetooth stereo headset worth Php7,490; fast-charging wireless charger worth Php1,900; and an LG G7 ThinQ premium case worth Php1,500. To get their devices, consumers may claim it in the store it was pre-ordered by simply paying their balance starting June 11, 2018. On that note, the reservation will be cancelled if they don’t claim their handset until August 10, 2018. In addition, customers need to present the official receipt of their downpayment, and their valid ID. Meanwhile, LG noted that this offer isn’t convertible to cash, and cannot be availed with other promotions. The pre-order promo is available at participating LG concept stores beginning May 30 to June 10, 2018.